Upon arrival at the Varanasi Airport or railway station, you will be picked up by one of our representatives to get transferred to the pre-booked hotel. After freshen up proceed to attend the visually stunning spectacle of your life, the majestic aarti on the banks of river Ganges. It is a mystical tradition of thousands of years and one of the major attractions of the city as well. Return back to the hotel for dinner and overnight stay. In the morning get up early in the morning and take a boat ride towards the banks of river Ganga to enjoy the magnificent views of sunrise. Get back to the hotel for breakfast and then go for Varanasi city tour. Proceed towards Sarnath which is 10 km from Varanasi and is one of the most revered Buddhist pilgrimage centers where Lord Buddha preached his first sermon. The area is a treasure trove of archaeological findings such as Dharmrajika Stupa and Mulgandhkuti Vihar. Also visit the Archaeological Museum, Ashoka Pillar, Bodhi Tree, Buddha Statue, Deer Park etc. Return back to the hotel for dinner and overnight stay. On the last day of Varanasi Tour Package check-out from the hotel post breakfast and transfer to Varanasi Airport/Railway station for the return journey. 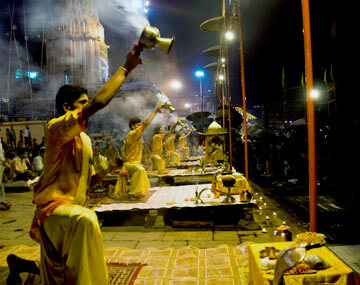 Varanasi which is also fondly known as Kashi or Benaras is one of the oldest inhabited cities on planet Earth. Each nook and corner of this holy city has its own charm and charisma that abound its each visitor. It is one of the most sacred and spiritually enlightened cities in Hinduism and an auspicious place to die. If you are really looking forward to meet colourful, vibrant and spiritual India the book your Varanasi holiday package now. BookOtrip helps you to explore the choicest corner of the world. Whatever you want to see, which- ever place you want to visit we are here you offer you the best. We as your travel partner take care of every minute detail from flights bookings to hotel accommodations from car rentals to travel insurance to make your holiday trip enjoyable and hassle free. Ganga looks so beautiful when the sun sets. It is the holy place one should visit. I had felt very pleasant on the boat ride. Bookotrip thank you.